Ann Whiten was one of the illegitimate children of Mary Whiten and Robert Nightingale of Haddenham in Cambridgeshire, England. Above: Headstone Ann Whiten, with husband John Yarrow, and grandson John Owen Yarrow at Stretham. Photo: Andrew Martin. 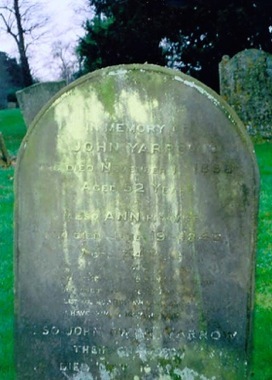 Ann married John Yarrow of Little Thetford in 1829, and the couple became parents twice before she died prematurely in 1843 at just 34 years old. Their youngest child was only about 11 years old. Widower John then went on to re-marry to Elizabeth Jeffery of Ely, and they soon extended the family with four more children. When John died in 1858, he was buried with Ann. Elizabeth out-lived him by 38 years, and was buried in Little Thetford. circa 1805 at Haddenham, Cambridgeshire, England. 7th April 1805 at Holy Trinity Church, Haddenham, Cambridgeshire, England. John Yarrow (1806-1858) on 2nd November 1829 at St. George's Church, Little Thetford, Cambridgeshire, England. 19th June 1843 in Little Thetford, Cambridgeshire, England, aged 34 years. 19th June 1843, with husband John, and grandson John Owen Yarrow, at St. James' Church, Stretham, Cambridgeshire, England.